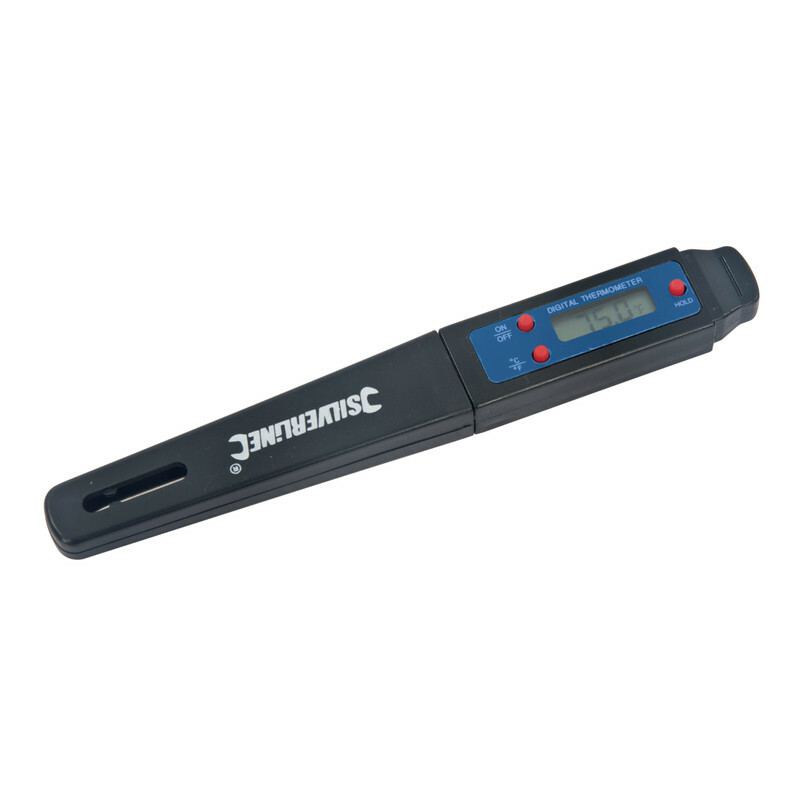 Measures in both Celsius and Fahrenheit and features a temperature hold function. Range from -40°C to +250°C. 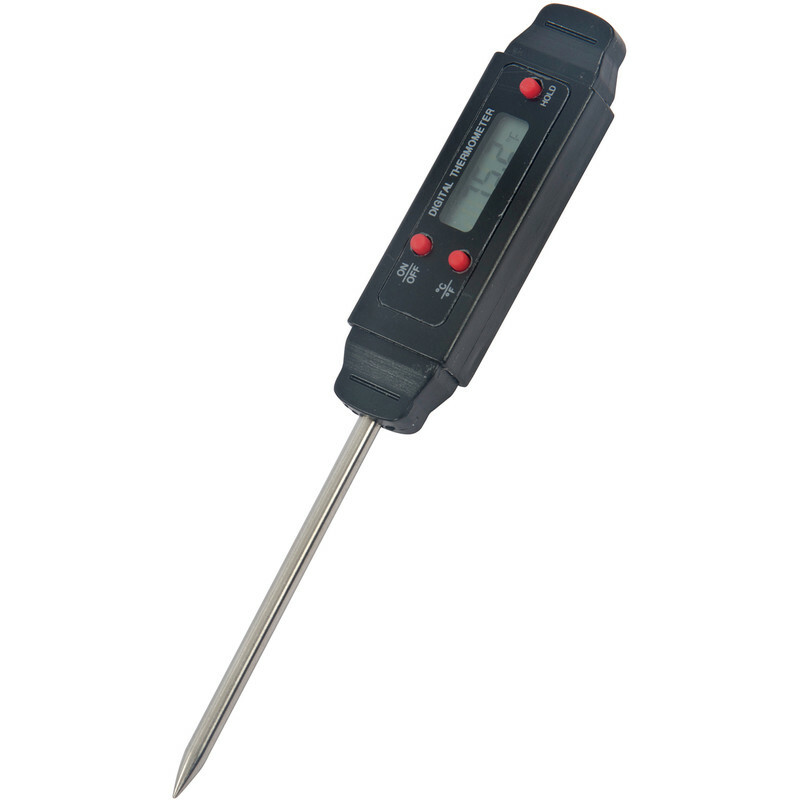 Digital Thermometer is rated 3.4 out of 5 by 7. Rated 5 out of 5 by John 1964 from Just the job If you need to take the temperature of something digitally, this is the boy for the job. Rated 1 out of 5 by Beany from Work - but very tedious to use! I bought this to use for balancing my radiators. Appears to measure temperature ok but is very slow to show a different temperature as it 'counts' down (or up) in 0.2 C steps/second to reach the new reading from the old, making the process very tedious. For example, I understand radiators sould be balanced 12deg C between inlet and outlet, which it would take more than a minute for each separate reading. I returned the thermometer and bought a £22 multimeter with temperature probes instead. NB the product is 'Silverline' not mentioned in the description blurb. Rated 5 out of 5 by Phil T from Compact design Ideal for checking temperatures quickly & effectively. Rated 4 out of 5 by smc369 from Difficult start but now happy with purchase. Purchased this so that I could monitor the temperature in side an electronics cabinet to check for overheating. I also thought it would be a useful addition to my toolbox. When I first removed the tab to energize the battery cell nothing happened! Luckily I had a spare button cell of the right type and replaced this and the device fired up and did the job I required. So the cell provided with this must have expired (hence the poor performance rating below), I know I could have returned this but did not want to waste any time. Rated 1 out of 5 by mario from No batteries dead I went to job and i needed to come back , to swap it. 8 in stock 1 had battery.